The Grice family added a light above the Club’s “Buddy” manatee sign posted on their property so that it comes on in the evenings and illuminates its important message for anyone in the area to clearly see. Note: A high resolution jpeg (300 dpi) image of the Club’s yellow boating banner is available upon request. The summer season has arrived, and the boating season is getting busier. Save the Manatee Club encourages the boating public to keep it safe on the water for all, including Florida’s abundant wildlife. For the manatee’s protection, boaters are urged to follow all posted boat speed regulations, slow down if manatees are in the vicinity, and keep to deep water channels when possible as manatees often gravitate toward shallow water areas. If manatees are spotted while swimming, snorkeling, or diving, remember to look but don’t touch and avoid excess noise and splashing. Practice passive observation and observe manatees from above water and from a distance. 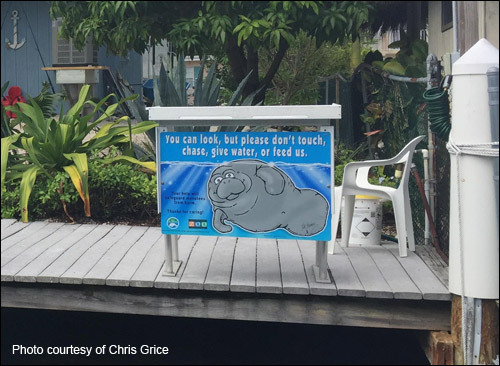 Resist the urge to feed manatees or give them water. Do not enter designated manatee sanctuaries for any reason. Stash any trash, and discard monofilament line, hooks and other trash properly. Other free signage from the Club include bright yellow metal docks signs, vinyl boating banners, waterproof manatee protection tips cards, and boat decals featuring the Florida Fish and Wildlife Conservation Commission’s hotline number for reporting dead, orphaned, sick, or injured manatees, or a manatee who is being harassed. The public is advised to call 1-888-404-FWCC (3922) or #FWC or *FWC on cellular phones, or VHF Channel 16 on marine radios, or send a text message to Tip@MyFWC.com. Download the free Manatee Alert App for iPhones and iPads, which notifies boaters when they are approaching manatee speed zones and helps facilitate the reporting of injured manatees and manatee harassment. Also view the Club’s animated boating video, “Share the Waterway,” for more tips. The free public awareness materials are available by contacting Save the Manatee Club via e-mail at education@savethemanatee.org or by calling toll free at 1-800-432-JOIN (5646).